Peck me here! Butterfly predation. 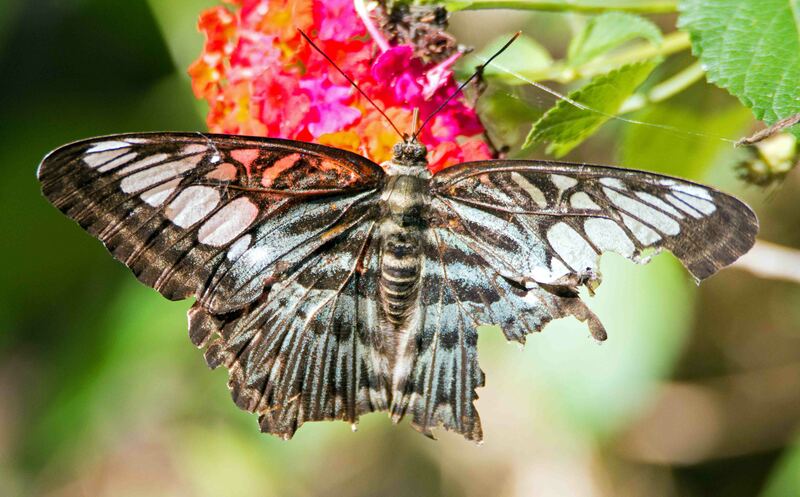 It is said that 50% of wild butterflies are killed and eaten before they get a chance to mate and reproduce (1). Poor things! One way to avoid being eaten is to divert the lethal pecks of predatory birds towards body parts that can be sacrificed in the interests of survival. Obtaining direct evidence for the protective utility of eyespots is difficult, but the deflective function of marginal eyespots has been demonstrated in some studies. It has also been shown to work well under low light conditions – such as at dawn and dusk – when birds are most active (2). 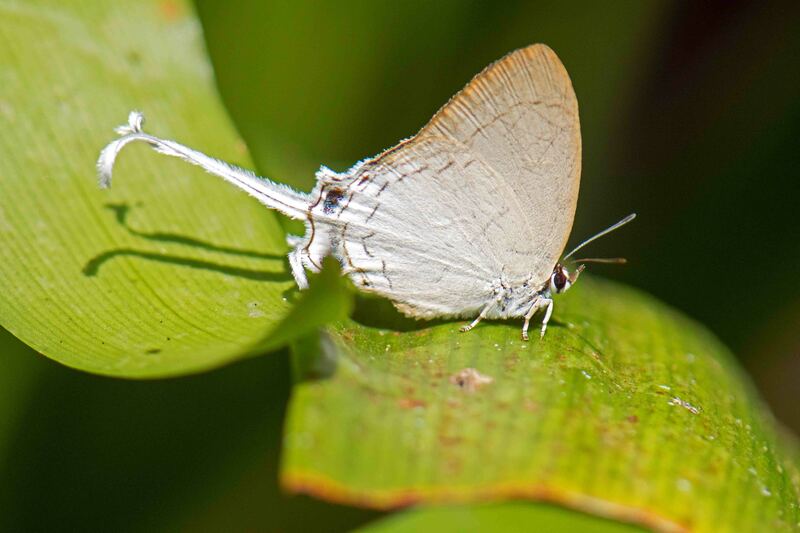 Photographs of butterflies often show evidence of extensive damage. Whilst such evidence of ‘beak marks’ – damage caused by a would be predator – is only circumstantial, it is a good indication of the fact that it is a regular occurrence in nature. Indeed, photographs could perhaps be used as a research tool into the intensity of such attacks, although one would only observe the survivors! The others would be inside the birds stomachs. Once pecked, as in the above photograph, the eyespot may be lost, so the butterfly is presumably more vulnerable to subsequent attacks. It has also been shown that eyespots can function in different ways in different seasons: eyespot plasticity! In the dry season, eyespots are a liability, so natural selection has resulted in the evolution of a spotless form – able to blend in well against brown, dead leaf litter – and another form, with eyespots, in the wet season, where they have an evolutionary useful deflective function (3). Another feature which has become obvious to me as I have taken more and more photographs of butterflies, is that they are seemingly able to fly about and carry out their lives, despite sustaining considerable damage to their wings. Some of this may be simple ‘wear and tear’ as well as predation damage. I have written about this before (4)! It’s a subject which fascinates me for some reason! Perhaps its something to do with our universal fragility? Compare these two images, below. The first, a highly worn and presumably ‘old’ butterfly – a male Clipper, Parthenos sylvia apicalis. The second, a much fresher specimen of the same species – but nevertheless, still sporting a beak mark on the left hind wing – which only became apparent to me after I photographed it and looked at the image on my computer. Yet both individual butterflies were gaily flying around and resting to feed on flowers. Indistinguishable to the casual observer. For some reason, perhaps to do with age, I take comfort in this fact! All three images were taken in Doi Chiang Dao, in northern Thailand. Olofsson, Martin, et al. 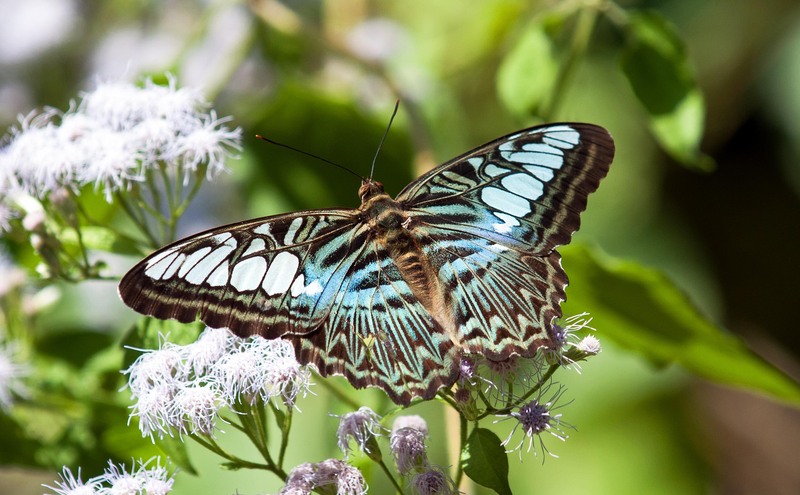 “Marginal eyespots on butterfly wings deflect bird attacks under low light intensities with UV wavelengths.” PLoS One 5.5 (2010): e10798-e10798. Lyytinen, Anne, et al. “Does predation maintain eyespot plasticity in Bicyclus anynana?.” Proceedings of the Royal Society of London B: Biological Sciences 271.1536 (2004): 279-283. Ray Cannon's nature notes Peck me here! Butterfly predation.